It sits on the floor--pages covered in sticky Post It notes. This is what revision looks like. 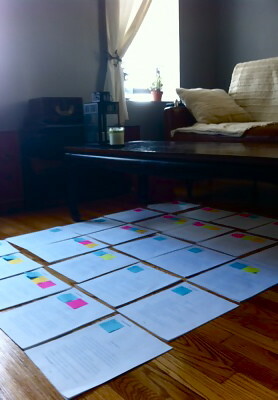 Sometimes it's easy to get lost in a novel-length manuscript. A character or plot thread could pop up in one scene, only to disappear for countless chapters. But you didn't see it back then. Why? Because in the writer's imagination, it all makes sense. I'm a big fan of Darcy Pattison's strategy for novel revision, The Shrunken Manuscript. Stella says: revision is tough! 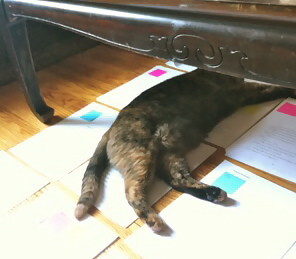 After combing through my outline, I spread the chapters on the floor. 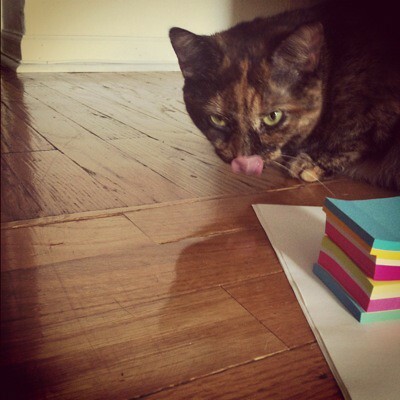 The rainbow of Post Its helps me "picture" the story. The book whispers: "This is what I want to be." Now it's time to listen.